An Indonesian monkey who shot to fame after it snapped a grinning selfie — and sparked a landmark US copyright case — was named “Person of the Year” Wednesday by the animal rights group that took on the simian’s cause. 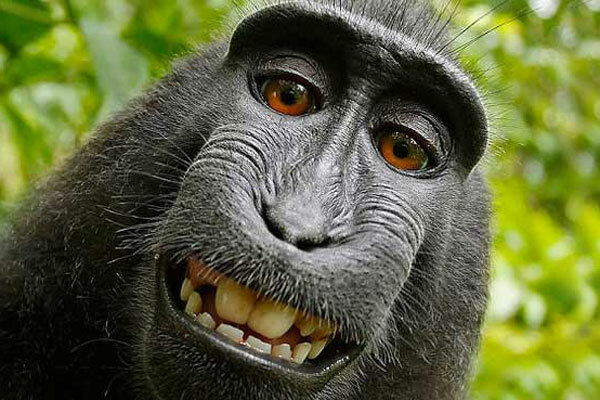 The People for the Ethical Treatment of Animals (PETA) said it was honouring Naruto, a crested black macaque with a goofy-looking grin, to recognise that “he is someone, not something”. The photos quickly went viral and PETA launched a lawsuit that claimed the then six-year-old Naruto should be “declared the author and owner of his photograph”. “Naruto’s historic selfie challenged the idea of who is a person and who is not and resulted in the first-ever lawsuit seeking to declare a nonhuman animal the owner of property, rather than being declared property himself,” PETA Founder Ingrid Newkirk said in a statement Wednesday. Slater maintained he owned the rights to the pictures since he engineered its creation — setting up the tripod and walking away for a few minutes, only to find out that the monkey had grabbed his camera and snapped away. The case was settled in September — before that court could make a ruling — with Slater agreeing to donate 25 percent of any future revenue from using or selling the monkey selfies to help protect the habitat of crested macaques in Indonesia. Authorities and activists have been trying to persuade villagers on Sulawesi to stop consuming the critically endangered monkeys, one of many creatures that form part of the local indigenous community’s diet.